Every so often I get a bee – no bug – no grasshopper in my bonnet to create an alternative to a food that’s been tempting me, or someone I know, to overindulge and sabotage my best clean-eating efforts! In this case, it was those darn Keebler Grasshopper Cookies giving my challenger -> turned friend -> turned COACH – Sharon, all kinds of trouble! Never mind that when she told me about it, she thought that I thought that she was actually eating grasshoppers of the insect variety, haha! Nope, I knew JUST what she was talking about, because I too have a love for all things minty and chocolaty! So I says to myself, “Self, what are we talking about here: mint and chocolate and cookie. 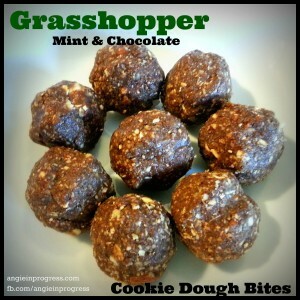 Why not make a mint chocolate cookie dough bite! ?” So I checked out my original Cookie Dough Bite recipe, and thought I’d tweak it a little and see what happened. The result was these tasty little things! In a food processor or blender, process the almonds, walnuts, oats, and salt to a fine meal. Transfer to bowl add Shakeology, honey and vanilla, peppermint and mix. Wet hands and roll into 1 tsp.-sized balls (should make about 12-15) and place them on a cookie pan lined with foil or parchment paper. Place the pan into the freezer for about an hour to firm up. Store balls in a tightly covered container, or Ziploc bag in the freezer. Here’s my FAVORITE Shakeology recipe! Guess what…It’s MINT and Chocolate!! Previous PostPrevious What’s for Lunch? Next PostNext In One Year!